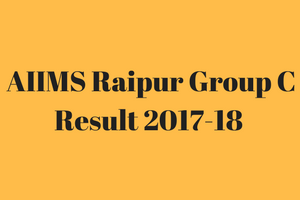 AIIMS Raipur Result 2017 2018 Group C Posts LThe result of Computer Based Test conducted by the All India Institute of Medical Sciences Raipur for the Group-C posts of Assistant Laundry Supervisor, Tailor Grade-III, Sanitary Inspector Grade-II, Library Attendant Grade-II, Medical Record Technician, Coding Clerk, Driver (Ordinary Grade), Lab Attendant Grade-II, Junior Warden (House Keeper) and Hospital Attendant Grade-III (Nursing Orderly) will be published shortly after the commencement of the CBT, the date of which has not been announced yet but soon as it gets announced, we’ll declare it through our web portal www.jobsandhan.com. Latest Update: AIIMS Raipur results will be published in June-July. Authority All India Institute of Medical Sciences, Raipur (AIIMS). Name of The posts Group C.
The recruitment of Grade-C posts like Assistant Laundry Supervisor, Tailor Grade-III, Sanitary Inspector Grade-II, Library Attendant Grade-II, Medical Record Technician, Coding Clerk, Driver (Ordinary Grade), Lab Attendant Grade-II, Junior Warden (House Keeper) and Hospital Attendant Grade-III (Nursing Orderly) in All India Institute of Medical Sciences Raipur, will undergo 2 stages of tests- Computer Based Test and then Skill Test. At first there will be Computer Based Test and on the basis of the score of the candidates in this, they will be shortlisted for the Skill Test. The final Merit list of AIIMS Raipur will be prepared keeping in mind the performance of the candidates in the Computer Based Test as well as Skill Test but the later being qualifying in natute, it’s marks will not be added with that of the CBT. So the marks of CBT will be considered while selecting the candidates for the appointment of the Group-C posts. If any tie occurs between 2 or more candidates then it will get resolved by the date of birth of the candidates and the older candidate will get preference over the younger one. If things don’t get resolved by the date of birth then the alphabetical order of the names of the candidates will be considered. Seperate merit list will be prepared for seprate category and posts. The candidates will be able to check the result after it gets published in the official website of AIIMS Raipur : www.aiimsraipur.edu.in, putting relevant details. The cut off marks for AIIMS Raipur Group-C Computer Based test and Skill test has not been declared yet but it falls under the discretion of the recruitment authority to take decision regarding this.